Pitching coach Dave Righetti #19 and catcher Buster Posey #28 of the San Francisco Giants comes out to talk with pitcher Jeff Samardzija #29 after Samardzija gave up a two-run homer against the Minnesota Twins in the top of the fifth inning at AT&T Park on June 10, 2017 in San Francisco, California. SAN FRANCISCO — Bruce Bochy raved about young Jose Berrios before Saturday’s game, and the right-hander’s repertoire certainly was as advertised. But truth be told, it doesn’t take a 95 mph fastball and wipeout slurve to hold down the Giants at AT&T Park. Berrios simply became the latest to do it. 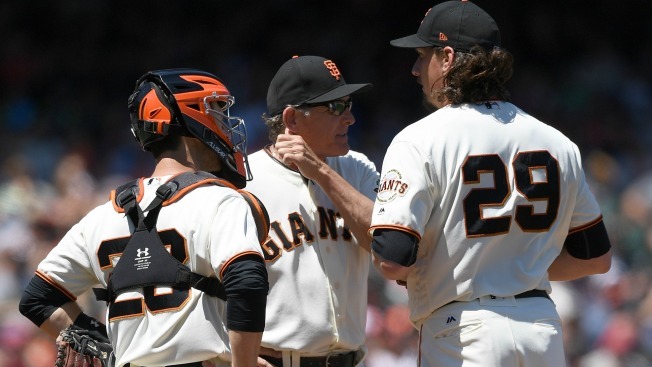 The Giants wasted plenty of opportunities to tack on against Berrios and the Twins responded with two homers off Jeff Samardzija, who as always, deserved better. The 3-2 loss guaranteed a series loss. —Brandon Belt smoked a fastball into the cove in the first for the 73rd career Splash Hit. It was Belt’s seventh, tying him with Pablo Sandoval for second all-time. Belt needs just 28 more Splash Hits to tie Barry Bonds’ record. —Kenny Vargas hit an absolute bomb to right-center in the fourth inning. The homer came off the bat at 116 mph and traveled 471 feet, according to Statcast. Brian Dozier also took Samardzija deep. —A walk of Robbie Grossman in the fifth was just the second issued by Jeff Samardzija since the start of May. Still, he didn’t do much to harm his incredible run. Over his past eight starts, Samardzija now has 65 strikeouts and two walks. —Hunter Pence went socks-down for the first time in a long time. It did not work. He struck out three times against Berrios and grounded out to second in his last at-bat. —Ehire Adrianza turned a slick double play in the sixth and then robbed Eduardo Nuñez on what looked to be an infield single in the seventh. The Giants kept him around so long because of that glove at short, and it appears he’s found a home in Minnesota.